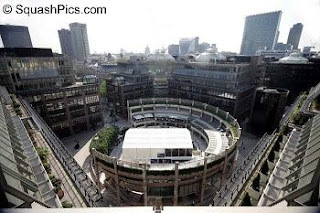 It has been sadly announced that there will be no men's Super Series Finals at Broadgate Arena in London this year. I have attended this event for the past few years, and have seen some classic confrontations - the pick of which must have been Jonathon Power's demolition of the more highly-fancied Thierry Lincou in straight games in the 2005 final. Each year, six touranaments on the tour are designated Super Series events. These include major events such as the World Open and the PSA Masters. Then, early the next year, the eight best-performing players from the Super Series events are invited to compete in the Super Series Squash Finals (a similar event to the Tennis Masters Cup). Though squash has recently attracted some big-money investment, it seems that sponsors are still hesitant about offering funding to tournaments in Britain.